A new chit chat cafe “The Coffee Shop”. Coffee Lovers- here’s a shout out for you! 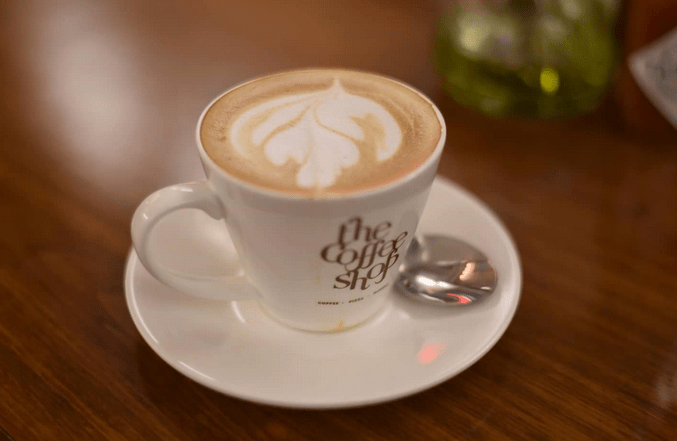 Newly opened ‘The Coffee Shop’ is a corner shop in the PVR market, Saket. With decent interiors, soothing music, polite, quick and courteous staff, the place for sure is one of the most recommended hang out places in the vicinity. This place is exactly where a coffee lover would love to be. Economically priced, each sip of the amazing coffee is absolutely worth it! The menu has some good grub options as well. A special mention to the fact that there are some “Super Food” menu items to be tried for all my health conscious buddies. As the team ChicLifeByte visited “The Coffee Shop”, we ordered for a Cappucino and as expected the presentation was as perfect as its taste, served in a pristine white mug with a little leaf pattern in the foam. 100% Arabica coffee, undoubtedly coffee connoisseurs. Next we ordered an assorted Veg Snack Platter comprising Cherry Tomato Garlic Bread, Cheesy Garlic Bread and Cheesy Rice Balls. Plateful, mouthful and absolutely delicious!! Cheesy Garlic Bread with melting cheese bubbling on crusty, buttery garlic bread, covered in Italian herbs….mouth watering, indeed. The Cheesy Rice Balls featured a perfectly crisp top layer with a luxurious soft interior, which made the overall effect wonderful beyond words. By the time we finished the platter, we were so done that we decided to skip the mains and ordered for a soup instead. So came my all time favourite Minestrone soup – An absolutely great bowl of minestrone arrived that was overflowing with rich vegetables with all flavours intact. Disappointing for the dessert lover that I am, the bakery hadn’t started when I visited (but has started now) so my next visit will be full of cakes, cookies and croissants! The manager and service staff are quick, friendly and confident. Beautiful decor, great staff, excellent food and most importantly excellent coffee. My favorite from here is the basic Cappuccino with cheesy garlic bread. This joint is one such place where we would love to go with friends, family and close ones to sip a cup of nice coffee with some light snack every now and then.